I haven’t done much painting for a while, but I finally got around to painting another Skyscape Bauble. I’d had the idea for this one for a while, but it kept getting pushed back by academic commitments. My fourth Skyscape Bauble is Stormy Sea. 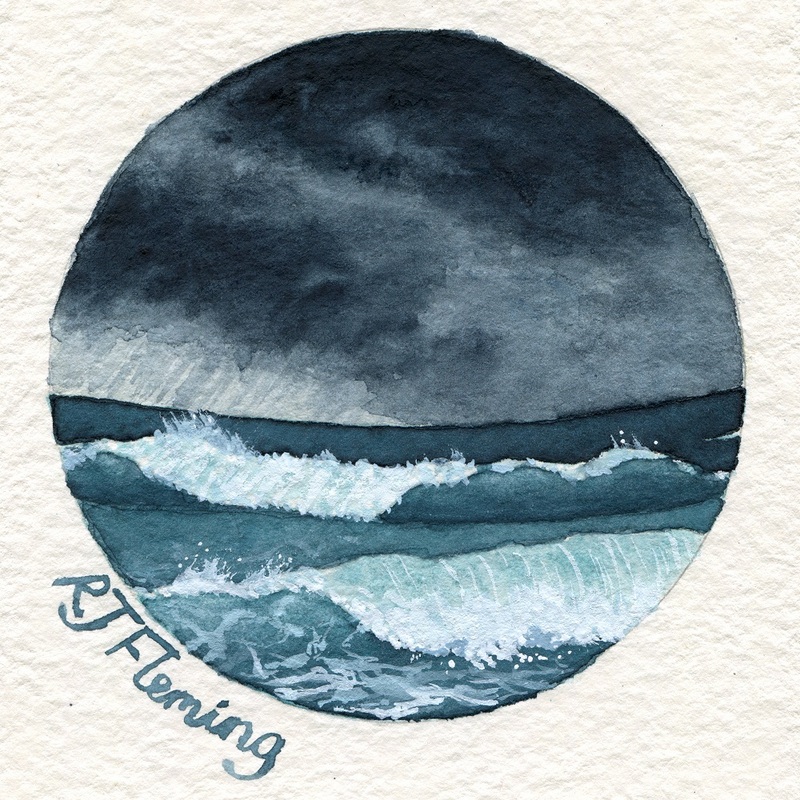 I had originally planned to paint a moonlit ocean, but as I fiddled with the composition I wanted, I figured it would be hard to convey the full range of colours in the waves with only the distant moon as a light source. I decided to make the sky stormy instead, with rain falling in the distance. The waves were painted with varying shades of Cobalt Green Turquoise and Paynes Grey, while white gouache was used to create the foam. A barely noticeable wash of Raw Sienna was applied over the sky area before the clouds were painted in, as I find this helps it look less flat than just having to cover up white. “Stormy Sea”. Schmincke and Winsor & Newton watercolours and Art Spectrum gouache. I’m not sure how many more of these Skyscape Baubles I’ll paint. I did have an idea for another one but haven’t been able to work out a composition OR colour scheme that I like and that accurately shows the subject, so I’ve kind of lost interest in it. I still have a few pieces of the handmade watercolour paper I’ve used for the series though, so if I do come up with another idea, I’ll paint a fifth Skyscape Bauble. This entry was posted in Projects and tagged Painting, Skyscape Baubles, Watercolour. Bookmark the permalink.